And whatsoever ye do in word or deed, do all in the name of the Lord Jesus, giving thanks to God and the Father by Him. “Colossians 3:17. Philip Steven Watkins, the youngest of five siblings, was born in Columbus Ohio, to the late Pastors Charles Clifford and Bernice Watkins. 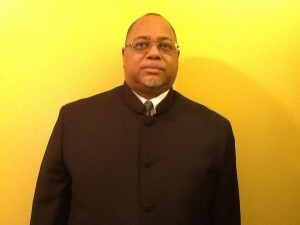 At the age of 18, Pastor Watkins enlisted, and served 4 years in the US Marine Corps at the Quantico Marine Base. In 1975, while at Quantico, VA, he was introduced to the Apostolic Doctrine at the New Light Church of Christ in Dumfries, VA where the late Bishop Jesse F. and Mother Poultria Pemberton were founders. Pastor Watkins was baptized in Jesus name, and on Sunday morning, July 17, 1977, he received the joy and power of the Holy Ghost speaking in other tongues as the Spirit of God gives the utterance. He followed as Bishop Pemberton taught Colossians 3:23. “And whatsoever ye do, do it heartily, as unto the Lord. Pastor Watkins sought the Lord and served in many offices for the effectual working of the ministry. In 1980, Elder Watkins acknowledged his call to the ministry and began to teach and preach faithfully at the New Light Church of Christ in Dumfries, VA until Bishop Jesse F. Pemberton went home to be with the Lord. In 1985, Pastor Watkins began attending The Greater Morning Star Pentecostal Church in Washington, DC under the pastoral ministry of Bishop Ramsey N. Butler. Bishop Charles Johnson succeeded Bishop Butler after Bishop Butler became ill. Both of their testimonies greatly increased Pastor Watkins perception of the purpose of ministry and of the need to minister the Word with understanding through discipline, preparation and compassion. In 1986, Elder Watkins was licensed in the Pentecostal Assemblies of the World. Inc. and later graduated with his Bachelor of Arts in Pastoral Ministry from the Aenon Bible College, Inc., of Indianapolis, IN. By the grace of God, Pastor Watkins remained faithful as his ministry grew. Moreover, on March 29, 1997, Pastor Watkins was united in holy matrimony with Sister Gwendolyn Arnold of Washington, DC and the Lord blessed them with a beautiful daughter, Emily Ross Watkins, on April 2008. On July 4, 2010, GMSAC celebrated its 10th Church and Pastoral Anniversary. The church has continued in the faith as Pastor Watkins exhorts all people to repent, to be baptized in JESUS name for the removal of sins, to receive his gifts of the Holy Ghost and to walk in holiness. Though weekly worship services; outreach-including an active nursing home ministry, the annual showers of Blessing Apostolic Youth Conference, the Prayer Warrior’s Prayer Breakfast; and Holiday Food Basket Programs, GMSAC lifts up Christ who charges lives.